The latest estimates state that identity fraud alone costs the UK over £1.7 billion a year. If you think about the amount of paper documents that contain sensitive personal information you collect over a year you soon realise that you must now take the disposal of these documents seriously to avoid an attack on your identity. The shredder simply makes the sensitive documents you would have previously thrown away with your normal household waste, very difficult to read any meaningful information. The resulting waste can then be thrown away or recycled safe in the knowledge that all the information that the documents did contain, has been effectively destroyed. This type of shredder is the most common. As its name suggests, it cuts your documents into strips of varying width - 10mm being the most common. Strip cut shredders because they cut the paper along its length tend to product bulky waste, which can mean this type of shredder is quite large as they have to accommodate a larger waste bin. They are however, the cheapest type of shredder on the market. From a security standpoint, someone could reassemble your documents from the strips you throw away, but this is time consuming. This type of paper shredder also cuts your documents along their length, but also along their width as well. This produces confetti-like waste paper. The practical upshot of this is that the waste is better compressed and easier to handle. These shredders tend to be smaller and better suited for a home office environment, but they are usually more expensive than their strip cut counterparts. Also, the level of security if the resulting shredded documents is much better. 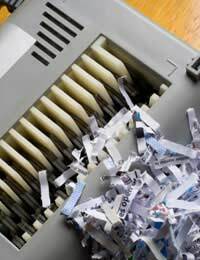 Anyone wanting to steal your identity would need a lot of time and patience to reassemble any sensitive document that has been cross cut shredded. The shedder may be designed for paper, but manufacturers soon realised that customers also wanted to shred other items as well. CD’s DVD’s and credit cards are the most common as these could contain sensitive information that need to be destroyed. Some shredders have just one set of cutting blades for all material, with other models offering a separate slot for shedding CD material. The blades on a shredder can be heavy duty as they may have to cut through CD or credit card plastic. Cheaper shredders may not have a cut off safety switch in the event of any material becoming stuck in between the blades. It is important to look for a high quality shredder that has this safety switch built in. This ensures that if you take the paper waste bin out of the shedder, or remove the cutting section, the mains power is cut to avoid any accidents. With identity theft now a real issue for everyone, equipping your home with a shredder offers piece of mind as you can be assured that all of the confidential documents you want to dispose of have been properly destroyed. Today you are spoilt for choice with the range of shredders available on the market. If you think carefully about your needs, you can buy the right shredder to help you fight identity theft.